Survive vs. Thrive. Or, "I went to school at 7:30 and I turned out fine." Sure, we survived. And most kids today will also survive the chronic sleep deprivation of their teen years. But what many people who survived starting at 7:30 don’t understand is: Like the drunk guy who insists he isn’t too drunk to drive home, we do not know how sleep-deprived we are when we are sleep-deprived. “With chronic sleep restriction over months or years, an individual will actually acclimate to their impaired performance, lower alertness, and reduced energy levels. That low-level exhaustion becomes their accepted norm, or baseline. Individuals fail to recognize how their perennial state of sleep deficiency has come to compromise their mental aptitude and physical vitality, including the slow accumulation of ill health.” (p. 137) Why We Sleep, Matthew Walker, PhD. Is this state of chronic exhaustion what we want for our children during the formative years of their lives? This in exchange for what? To save a few tax dollars, for a little more time after school to fill with homework and 3 hours of sports practice? Should we ignore the substantial body of evidence that our kids would be much better off with later start times and more sleep, just because we didn’t know better 20 years ago? Don’t we pay to remove asbestos from our schools and lead from our drinking water, things we did not always know were harmful? Do we let our teens smoke just because we did so as teenagers? Will a change in start times fix every problem teens face? Changing start times is not a magic solution to all teen issues. But it will increase the amount of sleep teens get. And more sleep is a prerequisite for other interventions to be effective. For example, one initiative that New Canaan is implementing is Emotional Intelligence programming. At a presentation on Emotional Intelligence in New Canaan in October 2018, Marc Brackett showed the slide above. The top 3 words that teens use to describe how they feel are “tired”, “stressed” and “bored”. Brackett remarked that self-care, including adequate sleep, has to be the starting point of any attempt to be more emotionally intelligent or to reduce these negative feelings and increase positive ones. Just as it is counter-productive to send a sleep-deprived child to school, because sleep is so profoundly linked to learning, it is also irrational to expect a sleep-deprived teen to act in an emotionally intelligent manner or to be resilient in the face of stressors. Parents accept this when their children are young -there is little to be done about a tired child’s demeanor or behavior except to get them to sleep. It is the same for our older children, who still need a lot more sleep than adults - at least 8.5-9.5 hours a night. Why should parents accept a school system that deprives our children of this basic need while at the same time demanding that they perform with excellence? Worse yet, a large chunk of REM sleep occurs in the early morning hours. Waking our children early in the morning to sit bleary-eyed in a classroom when their bodies and brains want to be asleep robs them of a disproportionate amount of REM sleep. Waking two hours too early may result in a 25% reduction in total sleep, but they may lose 60-90% of their REM sleep. Now that we know that our teens cannot be the best versions of themselves without adequate sleep, why wouldn’t we make a change? In addition to the Emotional Intelligence program, the district is evaluating other changes that, along with more sleep, can help our teens thrive with less negative stress. These include evaluating homework loads, school day schedule changes and other wellness initiatives. These are all good things to do. But without the additional sleep that they all need, all of these interventions will still result in teens who are “tired”, operating on a less than optimal level, day in and day out. Sleep is a basic need. It is a critical component of mental and physical health and the ability to learn. Teens need 8.5-9.5 hours of sleep a night and they need it at the right time - their body clocks shift later, so getting to bed earlier than about 11PM is not a viable option. The majority of New Canaan teens are getting 7 or fewer hours of sleep. Our teens are chronically sleep-deprived and chronic sleep-deprivation is harmful. Sleep-deprived teens are less able to deal with stress, less resilient and more likely to suffer from depression and anxiety. They are more likely to use alcohol and drugs and behave impulsively. Sleep also has a profound impact on learning - we need sleep to effectively process and store new information. It is counter-productive to send a sleep-deprived child to school. Without the REM sleep of the early morning (5am-7am) hours, our teens are not as creative or as able to build connections between things they have learned as they could be. Drowsy teen drivers are also a safety concern - there are more accidents caused by drowsy driving than alcohol and drugs combined. Our teens cannot get adequate sleep with the current school schedule. To do nothing is to continue to do harm to our teens. It also foolishly neglects to reap the many benefits of adequate sleep. None of this is our opinion. Every major medical organization has recommended middle and high school start no earlier than 8:30 a.m.. Read the American Academy of Pediatrics paper on adolescent sleep and school start times for more information. Does a start time change for grades 7-12 mean other grades have to start at 7:30? Not necessarily. The calculation is fairly simple. If parents in New Canaan do not want any child going to school as early as 7:30, then we will likely need to pay for more buses. There are multiple options and multiple costs for making the change. What is clear is that change is necessary - we cannot continue to inflict systematic sleep deprivation on our teens. We have to give them more time for sleep. As a town, we have to come together to decide which option for doing that is the best one. Why is busing such a factor in later start times? Because busing drives the cost of the change. It is also a major constraint in determining what start times are possible for each school. New Canaan has a 3-tier bus system. This was adopted sometime in the 90s as a way to save money on busing. Instead of two start times in the system, both after 8AM, they added a 3rd time - 7:30 a.m. It is unlikely we would make that decision again, now that there is so much research about the impact the 7:30 start time and the resulting sleep deprivation has had on teens. What does the research say about elementary schools starting at 7:30? There isn’t as much research on the impact of earlier start times for elementary age kids as there is on adolescent sleep. Several districts have made the change in a cost-neutral way by swapping start times. However, many districts decide to fund more buses so that no school has to start as early as 7:30. Won't teens just go to bed later? No! Many districts around the country have changed start times and the fact is that teens get more sleep when start times are later. Wilton, for example, changed start times in 2006. Bedtimes remained constant and wake times shifted later. A 40 minute change in start time resulted in 35 minutes of additional sleep on school nights. Recently, research in Seattle Public Schools after they changed start times showed that the teens are using the time for sleep. In the survey New Canaan conducted last spring, 87% of parents and students said they would use the time for sleep. Sleep is a basic need. It is a critical component of mental and physical health and the ability to learn. Teens need 8.5-9.5 hours of sleep a night. Most of them are getting 7 or fewer hours of sleep. Over 1/3 of them are getting 6 or fewer. This is a public health crisis that we must address. Don't teenagers need to learn to get up early to prepare for the "real world"? Or, why can't they just go to bed earlier? Sleep is a need, not a luxury; the only thing a lack of sleep prepares you for is to function below your potential. Asking a teenager to suffer sleep deprivation now in order to prepare for the real world is like asking a toddler to give up his nap in order to prepare for Kindergarten. Going to bed earlier is not a solution. Adolescents need about 8.5-9.5 hours of sleep a night, which is more than adults need. In addition, their sleep cycle shifts about two hours later, so that they have trouble falling asleep before 11 p.m. These changes occur in all human adolescents (and many other mammals) and are temporary. When they are adults in the real world, their sleep patterns will be adult sleep patterns. It is not coddling to allow a teenager to get enough sleep any more than it is coddling to allow them to get enough to eat. "Results show that starting the school day 50 minutes later has a significant positive effect on student achievement, which is roughly equivalent to raising teacher quality by one standard deviation." I'm worried that our sports programs will be disrupted. Some worry that athletes will have to occasionally miss class to make it to away games on time. However, within our athletic conference, several districts have changed their start times or are working on it. Greenwich and Wilton start later. Westport and Norwalk are working on it. The momentum is going in only one direction and as other towns adjust their start times, game scheduling will be a non-issue. Although we think later start can be implemented without causing athletes to miss anymore class time than they do now, we would also argue that the enormous benefit of getting an extra hour of sleep every day of the week far outweighs the downside of an occasional missed hour of class time during a given athletic season. Furthermore, athletes and coaches around the world are now aware that adequate sleep is one of the most effective ways to enhance performance and reduce injuries. 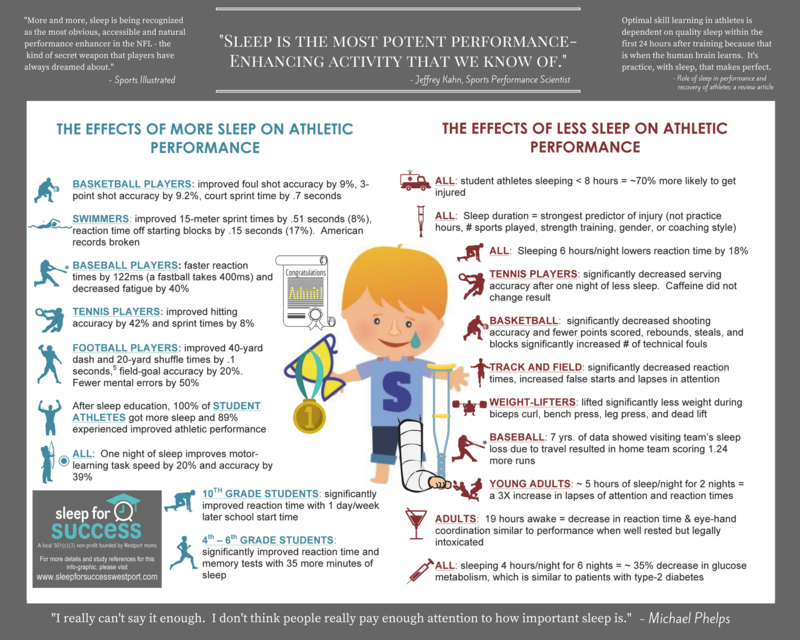 Christine Meier Schatz of Sleep for Success Westport created the visual below to show that sleep is a powerful sports performance enhancer. What time does school start in New Canaan? School start times in New Canaan are tiered into three time blocks. The same buses are used for each time block. Can't my child just make up for lost sleep on the weekends? Changing sleep patterns on weekends leads to a phenomenon that sleep scientists call social jetlag. Won't teachers just move office hours and club hours to the morning? This is certainly a concern and we have learned from other school districts, such as Palo Alto, CA, that it is important to protect morning time as part of a Later Start implementation. However, even if some teachers or clubs did meet in the mornings, this is optional, does not happen every day, and does not systematically harm every single student the way a 7:30 am start does.